Dr. McCoy is more critical of forms of malocclusion and their consequences because of his training in the impaired mouth/pinched airway program. Have the smile and self-confidence you’ve always wanted! This simple and almost invisible system turns imperfect smiles into great smiles. You can have straight teeth without traditional wire braces; Invisalign is the clear choice. This clinically proven dental procedure effectively and efficiently straightens your teeth for function and/or cosmetic dental improvements. 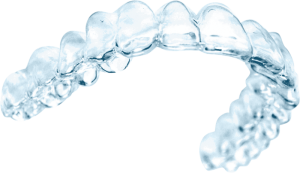 Invisalign gradually moves your teeth through a series of custom-made, removable, nearly invisible tray aligners. It’s removable so you can brush and floss normally, which prevents tooth decay and gum disease. Your gum health may improve as your teeth straighten. You can still eat what you want because your Aligners are removable. Cleanings (prophys) are quicker and easier because of the removable clear trays. Properly positioned teeth are easier to brush and floss than teeth that are crowded, crooked or spaced too far apart. Aligned teeth can help gums fit better around them, which may lead to better periodontal health. Sometimes speech problems result from poorly positioned teeth and jaw joints. Correction of the bite can help improve chewing and speech.